The Omni Series magnetic card reader is a manually operated 'heavy duty' swipe style slot reader which supports bi-directional reading of single, dual, or triple track magnetic cards conforming to ISO 7810 and 7811 standards, in addition to both card and paper bar code media. This series of readers feature standard configurations supporting magnetic stripe, or bar code or both, with either TTL level (undecoded magnetics, and/or bar code), RS232 or Keyboard Wedge (AT/XT, PS2) interfaces. The Omni Series readers are designed to support numerous barcode symbologies and all standard magnetic stripe configurations. Both RS232 and keyboard Wedge interfaces, include Bar Code and/or Magnetic Stripe decoding and data-formatting electronics. These units feature a multi-colored LED, beeper and extensive data editing capabilities. The slot allows for bar code media of .005" to .055" thick, and magnetic stripe media .01" to .055" thick. High Strength - Durable Housing - The Omni readers are designed for strength and durability with a die cast metal base and cover molded from thick impact resistant " Bulletproof " ABS plastic. The units are available with rubber feet and Velcro pads or they can be permanently mounted using the two tapped holes n the base. It is possible for secure mounting to tabletops or counters with the added flexibility to route the I/O cable out the side, end or straight down. Stainless steel wearplanes in all units allow the slot reader to easily support over 1,000,000 media passes. Reliable Reading- The readers have a magnetic read accuracy rate of less than one error in 100,000 bits* on cards conforming to ISO 7811 1-5. Visible or infrared bar code optics provide optimum reading reliability from 3 to 30 inches per second. 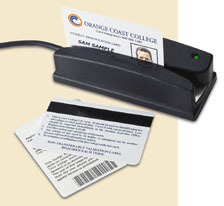 Versatile- The Omni Magnetic Card Reader is designed to support 1,2, or 3 track magnetic heads and/or bar code media as a bar code scanner. Either visible or infrared bar codes can be read. The magnetic stripe units reads, decodes, and formats ISO 7811, AAMVA, and CA DMV card formats. or call (541) 601-8282 for configurations and pricing for the magnetic card reader, bar code scanner, or combo units.